unfinished by Twain, will be brought to life by author Philip Stead and illustrator Erin Stead, the creators of the Caldecott Medal–winning A Sick Day for Amos McGee. The book, THE PURLOINING OF PRINCE OLEOMARGARINE, was acquired and edited by Frances Gilbert, Associate Publishing Director, Random House Books for Young Readers, from Tina Wexler at ICM, representing the Mark Twain House & Museum, and Emily van Beek at Folio Jr., representing the author/illustrator team. The New York Times heralded the news in this major feature article: A Rediscovered Mark Twain Fairy Tale Is Coming Soon. THE PURLOINING OF PRINCE OLEOMARGARINE, an eleven-chapter, 152-page illustrated storybook for all ages, will be published on September 26, 2017, with a first printing of 250,000 copies. The basis of this new work is sixteen pages of Twain’s handwritten notes after telling his young daughters a fairy tale one night in 1879 while the family was staying in Paris, an event he documented in his journal. In 2011, a visiting scholar at the Mark Twain Papers & Project at the University of California at Berkeley spotted the notes in the archives while conducting his own research and recognized their significance. Although Twain told his young daughters countless bedtime stories, made up on the spot as they requested them, these notes are believed to be the only ones he ever jotted down from those sessions. “To publish a new Twain story is an incredible literary event,” says Frances Gilbert. “When I first got the chance to read this unpublished Twain story, I couldn’t believe what I was holding. 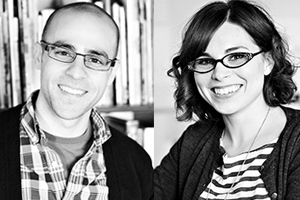 I’ve admired Erin and Philip Stead’s work since their first book and couldn’t think of a more ideal match for this project. It’s an American dream team.” [caption id="attachment_4724" align="alignleft" width="300"] Philip and Erin Stead[/caption] Philip and Erin Stead, two of today’s most notable names in children’s literature, have completed the text and illustrated the book, framing the narrative as a story “told to me by my friend, Mr. Mark Twain,” and even including occasional interruptions by an imagined meeting over tea between Philip and Twain. Exploring themes of charity, kindness, and bravery in the face of tyranny, with sharply drawn satire and tear-inducing pathos, this extraordinary combination of talent both classic and contemporary reaches its full potential as an old-fashioned—yet thoroughly modern—fully illustrated storybook that readers of every age will treasure. 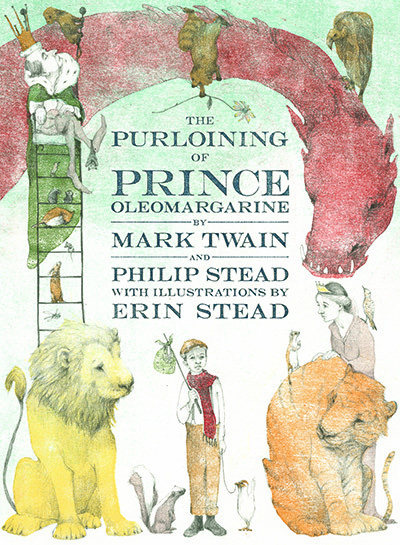 A monumental event not only in the world of children’s literature, but for literature overall, the publication of THE PURLOINING OF PRINCE OLEOMARGARINE will take place during the 150th anniversary of Mark Twain’s very first book, a collection of twenty-seven previously published stories titledThe Celebrated Jumping Frog of Calaveras County, and Other Sketches.